The K-Line Industries 900 Series harrow bar is a reliable unit designed for use with 90lb or 130lb stump jump harrows. 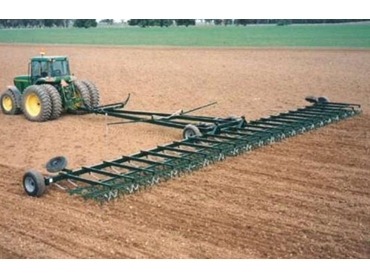 This combination is perfect for breaking down fallow, incorporating chemicals and seed bed preparation. The construction and special lift design of the 900 series makes it an ideal model for dumping when windrowing trash. Wings that fold forward and sit on overcentre hydraulic arms on A-frame. A special lift design used for fast dumping when windrowing trash. Opening and closing form tractor seat which has auto fold cables. Welded construction which suits 90lb and 130lb stump jump harrows.